Hair teas have grown in popularity in recent years. If you are having issues with growth, strength, shedding or softness it is defiantly worth a try. It is very simple and inexpensive. Teas are also rich in antioxidants, amino acids and contain some caffeine. The rinse naturally softens hair, increase sheen and restores lusters to the strands. Also works wonderfully for calming scalp issues and irritations. The rinse should always be room temperature before using. Never pour hot tea in your hair….no bueno. Just let it cool and then use it Apply the tea, massage your scalp, let it sit for a few minutes and rinse out. 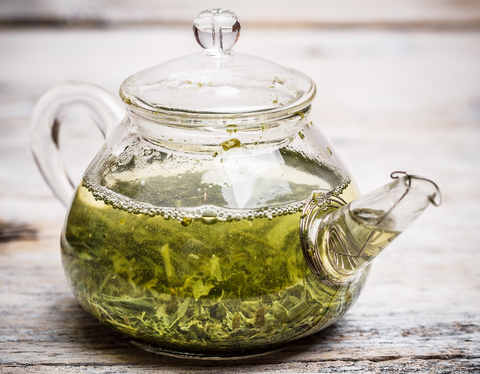 Green tea contains vitamins B5, C, D, and E. Green tea stimulates the hair follicle. Increased blood flow also aids in reducing shedding and increasing hair growth. Many people experience stiffness from black tea rinses. This is not a negative thing. Just follow up with a moisturizing deep conditioner and your hair will return back to being very soft again. Green tea on the other had is strengthening and softening…making it the best of both worlds. Honey is a humectant and provides moisture to the hair. It is added to the rinse for this reason. This is tea is brewed strong and is very effective. * You can add any other herbs or florals of choice at this point. Customizing the rinses is what makes it fun. -Cleanse your hair. Can cleanse with a shampoo, cleansing conditioner, or product of choice. -Heat the 2 cups of water. -Pour the water over the tea, add the honey, stir, cover and allow it to steep until cool. -Strain out the tea. Pour into a bottle/container. -Apply to the hair dry or wet hair. -Allow it to stay in the hair for 5-15 minutes. -Gently massage the scalp in a circular motion. -Rinse out with clean cold water. Optional: Follow up with an ACV rinse, if needed. If you have low porosity hair there is no need to use an ACV rinse. I do tea rinses on a weekly or biweekly basis. Let us know how you like it in the comment section. Share your favorite rinses too. NOTE: If you have any health issues that would not be conducive to trying these rinses please do not do so. I am not a physician. This article only contains information from my own experiences with tea rinsing. Do you do tea rinses?